Welcome, my fellow customizers (and Faerie wannabes)! In this in-depth guide and the ones that will follow, we'll be checking out some of the most famous Faerie wardrobes in Neopia! Dressing and acting like your favourite Faerie is something I'm sure we've all done at sometime or another, and if not, I hope you will find one of my guides to inspire you to give it a try! 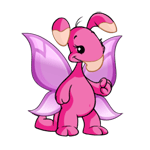 Faeries for me are what make the heart of Neopia itself; they are always the ones we turn to for help when we get sick, the ones who feed us when we are poor, they can turn us into pretty colours if we take a dip into their pool or they can send us on quests for the most bizarre items to find. Good or bad Faeries, light or dark, where would Neopia be without them?! So that's why they should be celebrated for their style and fashion in this step by step guide showing you just what it really takes to dress like a Faerie! In Part 1, I'll be showing you how to get the look just right with our first Faerie, which is of course, and she really needs no introduction, it is the Queen herself... Fyora! It was only right that I should start with her outfit first; after all, she is the head of ALL the Faeries, ruler of Faerieland and the most powerful. She'll sell you some rare artefacts in her Hidden Tower shop if you can afford it (or find it). So get ready to try some Fyora inspired wearables, enjoy! Info: This very accurate interpretation of our wonderful Queen Fyora's beautiful flow of purple hair with its little blue crown sitting neatly on top is just what your pet will need to start off this look. Info: This flowing Fyoras Collectors Dress will work stunningly well; it has a beautiful elegant line and flow to the way it will sit just right on your Neopet. Also this Fancy Pink Gown will make for a perfect Neopoint alternative for your Fyora outfit, the colours match astonishingly well with the purple and pink themes that we associate Fyora with and is must have for any wannabe queen. Info: What is a Faerie without their wings? It's what stands us apart from them (unless you are lucky enough to be painted with a Faerie Paint Brush that is) but for the rest of us you may want to try Faerie Queen Wings, for those who are not blessed with wings can now float and flutter, emulating the wonderful Fyora as well as any Faerie Neopet can. Info: Now where on earth would Fyora be without her staff? It is where her magic is kept. The glow of its power flowing from the orb, it's quite mesmerizing and after all who doesn't want a piece of Fyora's magic? She is a powerful Faerie so you certainly wouldn't want to get on the wrong side of it that's for sure! Info: Now that's just cruel! Who on earth would want to stick all those pins in a nice Fyora Plushie like that! But I'm sure Fyora is too powerful for this voodoo doll to have any effect on her... well, I hope not anyway. Info: Valentine's and Fyora; what could be a more perfect combination? This adorable little figure is the cutest Fyora item in my opinion and it will sit right beside your pet holding a cute little red heart in its hands. Also, this equally stunning Fyora Potted Flowers, inspired by Fyora's own garden, would make the perfect trinket to go with this theme as well. Info: A garland or a shower of Fyora's wings; now that is a tough one to choose from. Both create a beautiful butterfly effect, although they can't be worn together. Personally my favourite is the shower, with the way it flows gently down, then again an arch way full of fluttering wings to surround your pet; oh, I just can't decide! Can you? Info: Ah, don't we just love those floating dolls? Well, I do anyway. What Faerie fan can be without their Floating Fyora Doll, to watch over their Neopet? When the real Faerie is away, it makes the perfect accessory to show your loyalty to the Queen! Info: A surrounding fit for a Queen is all you need now to finish of this perfect look and what better than the Entrance to Fyoras Castle? Can you gain admittance dressed in your finest Fyora costume? I'm sure you can. Or you could have a hunt for the Hidden Tower Background that is just as ideal, for where else would Fyora be on a day to day basis than selling rare goods in her Hidden Tower shop? Now if only the real Hidden Tower could be as easy to find! Info: For those Neopoint fans out there that can't or haven't got the cash to splash, not to worry; there are some great Neopoint alternatives out there, like Faerie City Balcony Background, where Fyora loves spending her hours winding down and looking upon the beautiful sights of her Faerie City. 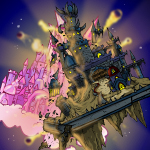 Or the tragic scene of the fall of Faerieland must not go unforgotten in this Faerielands Destruction Background where you could re-enact the scene when Fyora was saved from being turned from stone. Well, that's it for this Fyora outfit. I hope it has inspired you to try some of my ideas for your own pet and get them dressed up and looking like the best Queen in Neopia!! Stay tuned for Part 2 when things will be getting dark and mysterious with our next Faerie, Jhudora! Tip: All items shown in this article are suitable for all species to wear but don't forget that many species and paint brush clothing can make great alternatives for Faerie clothing too; for example in this outfit, a Poogle could wear a Delightful Poogle Dress for an alternative Fyora inspired dress.